Yup, there's a limit! 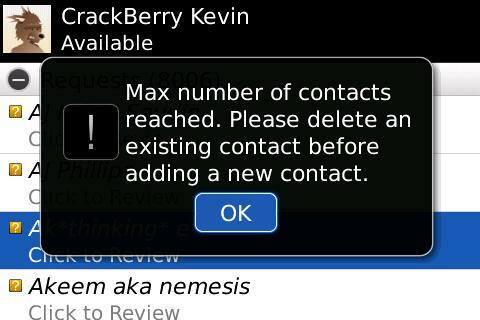 Though I still can't say what the exact "max #" of contacts is. This message finally popped up when I hit 8007 open Requests, 1388 actual approved Contacts, 616 Pending contacts, and 317 active Chats (see screencap below) and then tried to approve another request. However, it seems I can delete a pending contact (some of these seem to have gone into limbo) and approve a an active request and that will increase the number of approved contacts by one before getting the message again. So potentially if I delete all the pending contacts and keep approving requests I **think** I should hit around 2000 approved contacts before it caps out. But at least we know there is a max limit and it appears to be based on a combination of these different states of contacts (between pending, requests and contacts it's over 10,000 "names" active within the app). I'm gonna keep with it. 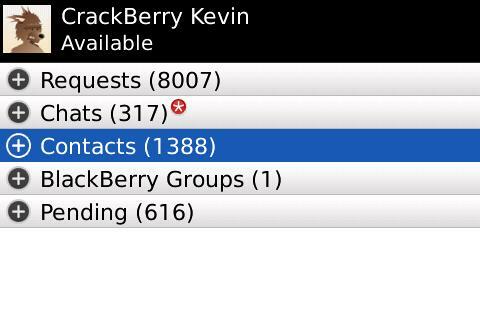 Still need to test out the wireless backup with that many contacts and try broadcasting a message to everyone! It's been a bit of a trying experience but and there's still a video to come that'll show off some of what's been going on. HUGE thank you goes out to everybody who has participated in this little stress experiment so far. I was hoping I'd be able to approve everyone onto my list, but it appears that likely won't be the case. So please don't take offense if your request message is left hanging. I'm not sure this Bold will ever be the same after this, so I may have to put it into retirement (replace it with a White 9000 or Bold 9700?!). It's definitely a history making device. Stay tuned for a final update!